David E. Moe has written a book that will be of use to any tennis player if they are open to a multi-disciplinary guide to improving their game. The Making of a Winner: A Fable About the Power Within takes tidbits from sports psychology, biofeedback and Eastern religions, and weaves them into a short primer on how to play better tennis. This isn't a book that concentrates on the virtues of an open-stance forehand versus a closed-stance, it is concerned with the mental and emotional aspects of becoming a better player. Not surprisingly, it carries a blurb from one James E. Loehr, one of the leading sports psychologists working in tennis. 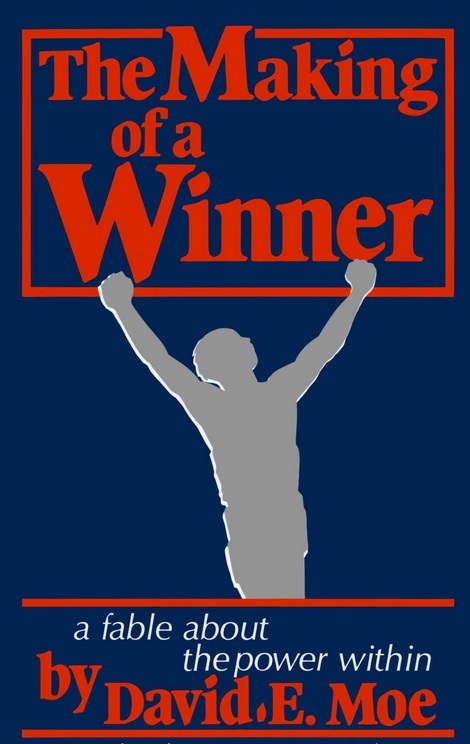 Published in 1990, The Making of a Winner also carries a recommendation from Arthur Ashe. The book's framework consists of a story about a young tennis player named John who has what we would now call anger management issues. His parents sign him up for lessons with a tennis teacher named Mr. Lovano who immediately gets to work on his bad attitude with a number of techniques that range from computerized personality assessments, to touches of Eastern meditation. As a tennis instructor, Mr. Lovano goes way beyond the approach you might encounter in USPTA or USPTR training videos. One tactic Mr. Lovano teaches his student is to re-swing the stroke after you make an error so that you are imprinting a more successful version of the shot you just screwed up. In the story, it works for John as he is able to beat a player who is described as being more macho, at least in as far as he can hit the ball harder. But John is able to pull out a win by using Mr. Lovano's positive reinforcement principles. Of course, there is a girl mixed in with the story as well. Marlene, another young player, wants to shape her own game so that it resembles Chris Evert's. She takes lessons from Mr. Lovano. The guy he beats in the final also wants to hang with Marlene, but apparently using Mr. Lovano's techniques not only helps the hero win the tournament, but also makes him a better boyfriend for Marlene. The Making of Winner would be a valuable addition to any young player's library if they have the patience to absorb and practice the lessons that Mr. Lovano, who is basically a mouthpiece for the author, espouses. It’s the kind of book that can help a player reach their full potential. Even though most of the characters and situations are aimed at young players, there are tips here that could conceivably help people like myself who having been playing so long that I am the only player at the East River Park courts still using a Continental Grip. The author describes himself as a teacher, philosopher, counselor and mathematician. From these various backgrounds, he has put together a tennis instruction book that may well reach a studious young player or veteran who has tried other approaches from Zen Tennis to Brad Gilbert's classic Winning Ugly. The Making of a Winner will probably not leap to the top of the tennis books bestseller list, but is a valuable tool. It's a shame it won't get a marketing push from a big publishing house because I could imagine catchy commercials on Tennis Channel saying, "If you ding it, just re-swing it." The Making of a Winner: A Fable About the Power Within is available on Amazon.com.